Game of War – Fire Age APK 3.13.495 has been released, the rival of the infamous Clash of Clan has gained popularity among mobile gamer. This game is a 2D free play MMO strategy game developed by Machine Zone. The game was built on the same theme with Clash of Clan, and nearly with the same goal. Creating and upgrading structures, add players or joining an alliance to defend castle pretty much are all the game is about. 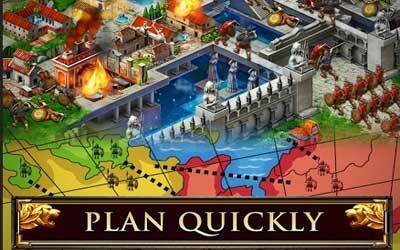 Game of War – Fire Age consists of quests players should complete and level system to power up the army. It is free to download. One of the most customizable feature is the multiple skill tree where Academy building and Hero level are placed. To boost the skill, players should complete a level and is not based on time. One of the most prominent feature in the game is the translator feature when player joining alliance. The purpose is for players to enjoy the same excitement using one server only. Alliance helps a lot in leveling up the game by helping others to defense their castles. It seems joining alliance is very important, thus player should always play online and interact with others. This game in-build Chat feature is also more comprehensive in feature differs from the other games. In one side this feature is good for players to communicate with each other, but it means the game requires more adult players and less safe for children since parents cannot control the communication happens between their children and people in the game. Another minus side that shadows this game the most is the lack of new feature that will keep players in excitement. However, the overall game is good and Game of War – Fire Age for android is worth to download.